Carmakers in India are facing severe competition and as a result need to offer more than the others or get left behind. Add to that, the Indian car buyer is also one of the most demanding today. Newer segments and body styles are constantly being introduced and are trying to appeal to a large chunk of buyers. Over the last few years, a particular type of vehicle targeted at larger families seems to be increasing in number, the compact MPV. 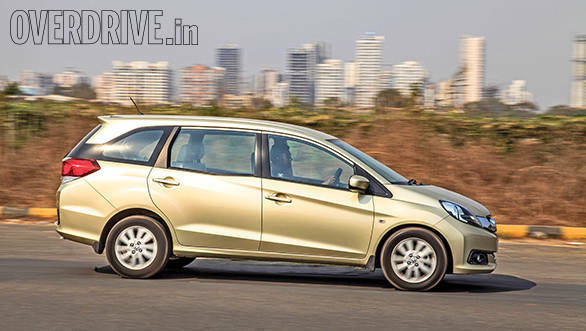 This segment also attracts prospective hatchback as well as sedan buyers. Maruti's Ertiga and the Honda Mobilio are the best examples and seem to be the current favourites among Indian families. Both the vehicles are smaller in footprint when compared to the more expensive Toyota Innova yet offer impressive space and better performance. This year will see the arrival of many more MPVs but the first to have rolled out is the Datsun Go+. It is based on an ever more compact platform and still manages to offer three-row seating. 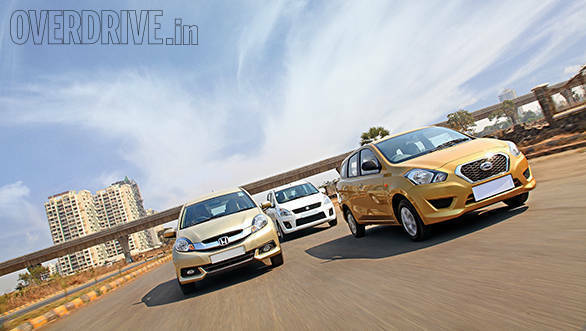 Is it a compromise or the ideal family car for the Indian masses? The three machines you see here are family wagons but follow a different design approach. The Mobilio and Go+ are based on the Brio and Go hatchbacks, which is why they both feature the same face and a bit of the side. Beyond the B-pillar, everything else is new because of the extended station wagon like body. 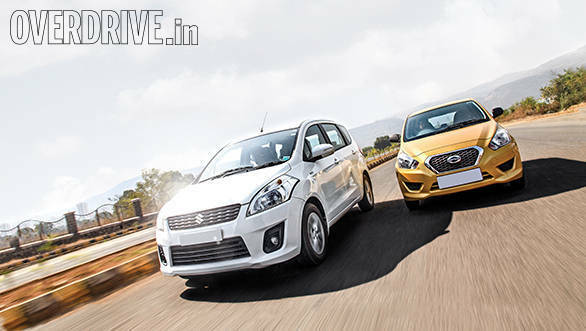 The Ertiga, meanwhile, shares its platform with the Swift. Its front end does look like it belongs to the Swift and Ritz family, so it is still appealing, but that's where the similarity ends. It's been designed as a proper MPV. The Go+ too is a smart design, the clean and modern face features the same D-grille as the Go. Datsun could have added a few distinguishing elements but have refrained from doing so in our opinion to keep costs low. The sides feature prominent rear shoulders that blend well with the tail lamps and continue to extend all the way to the tailgate. The back is a new design but most will mistake it for the Go hatchback. The Mobilio in comparison is the most stylish and breaks away from the traditional people carrier mould. The kink in the window line adds to the styling and increases the overall glass-house area. A more prominent shoulder line and the floating D-pillar make it stand out from the rest and the station wagon like appearance works in its favour too. Mobilio looks busy yet stylish from the side. . . Step inside the Go+ and you will be surprised. There is ample space inside to accommodate five adults and a third row that is good enough only for two kids and not adults - even Datsun confers. So while it is a seven-seater, the Mobilio and Ertiga are more spacious, thanks to larger dimensions. The Datsun, however, comes close when it comes to front and middle row knee-room as well as head-room. 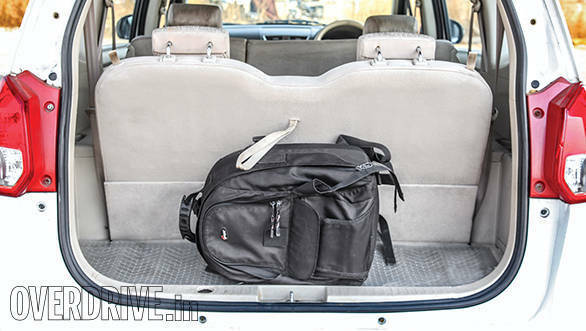 The third row seat can be folded and offers 347 litres of boot space in the process but with the seat not folded, it's just an unimpressive 48 litre. Since the Honda and Suzuki are larger vehicles, two adults can be accommodated in the third row too but it isn't as comfortable as the middle. 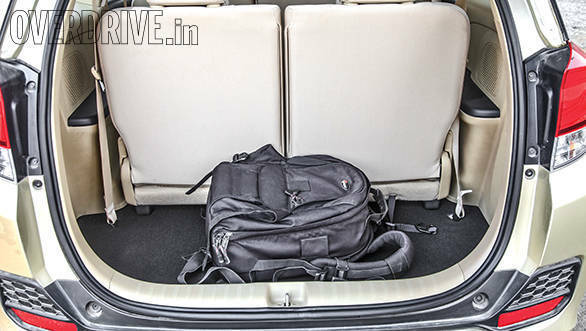 Boot space is also higher, the Ertiga offers 135 litres without the seats folded while the Mobilio offers even more (223 litres) thanks to better space management. The Go+ interior isn't finished as well as the others; the quality of plastic used isn't as good either. 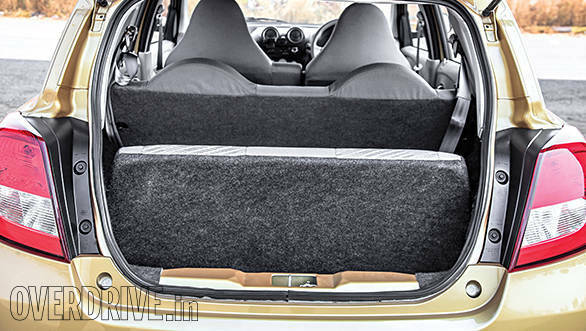 After all, it shares the interior with a budget hatchback. Changes could have been made to the Go+ interior. The glovebox, for instance, continues to come sans lid while the rear view mirror still doesn't offer a night mode. The seats are thinner, flat and not as supportive when compared to the Ertiga and Mobilio. The lack of under-thigh support is obvious and will be most missed on long drives. The Honda cabin may be spacious but isn't as appealing as its exterior. 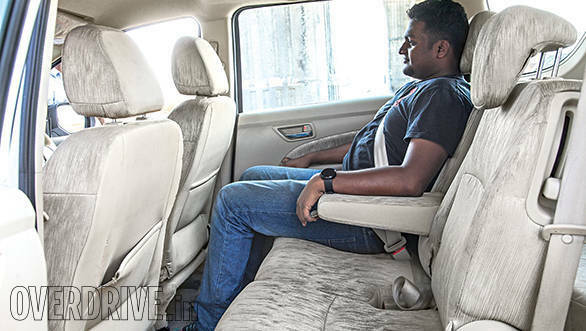 The front seats aren't as comfortable as the Ertiga's. 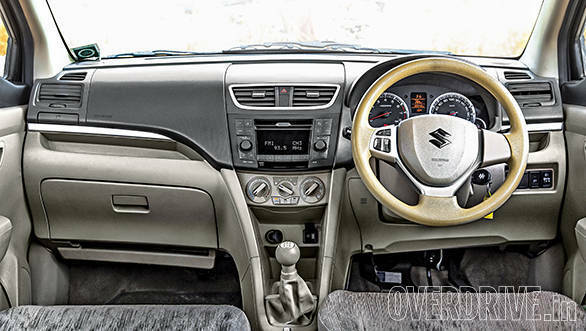 The Maruti also offers a better-looking interior and feels built to last. 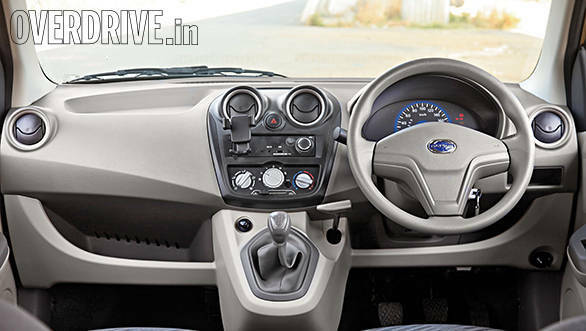 We are focusing only on the petrol variants because the Go+ is not offered with an oil-burner. The 1.2-litre petrol is exactly the same motor seen in the Go - the three-cylinder motor produces a maximum power of 68PS at 5,000rpm while maximum torque of 104Nm is available at 4,000rpm. These numbers aren't really impressive on paper especially since it is meant to haul five adults with two kids or luggage. However, it does a decent job especially when driven in town. The motor is eager and the short gear ratios help extract most of the power with ease. It is only on the highway when fully loaded that the engine starts to feel out of breath. The motor needs to work hard to stay in its sweet spot and while doing so is quite audible too. The 5-speed gearbox offers positive shifts but could have been smoother in operation. 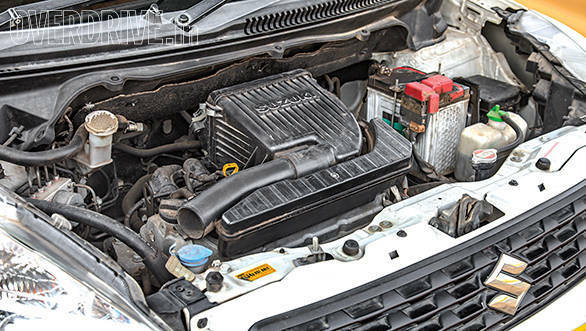 The Ertiga and Mobilio on the other hand, feature much larger engines that are more powerful and refined too. The 1.4-litre K-Series and the 1.5-litre i-VTEC motor puts out 95PS/130Nm and 119PS/145Nm respectively. The power advantage means lesser strain on the motor, making it better suited for touring even when completely loaded. The Honda motor is the most powerful of the lot and is most refined as well. 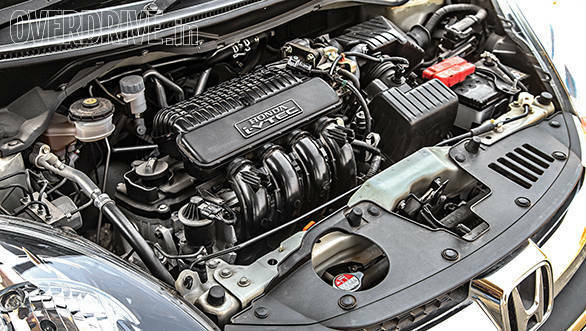 The engine offers good low-end poke as well as top-end performance. It's a typical Honda rev happy motor, the tacho needle easily climbs all the way to 6,500rpm. The Suzuki engine isn't as peppy but makes up with a more linear power delivery and strong mid-range performance. Gear shifts are smoother than on the Honda. On the road, the Go+ loses out in a straight line despite weighing considerably less. The Datsun reaches 100kmph from standstill in 13.9 seconds, the Honda and Maruti do the same in 11.9 and 12.8 seconds, respectively. 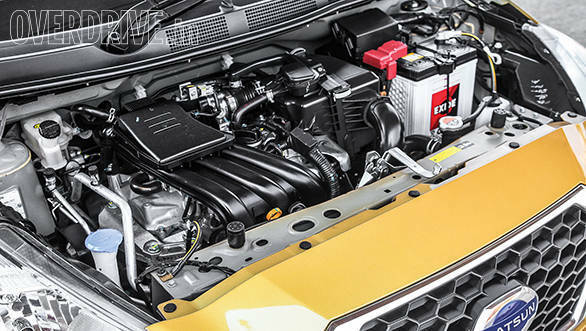 The Datsun's three-cylinder block however offers the best overall efficiency of the three. 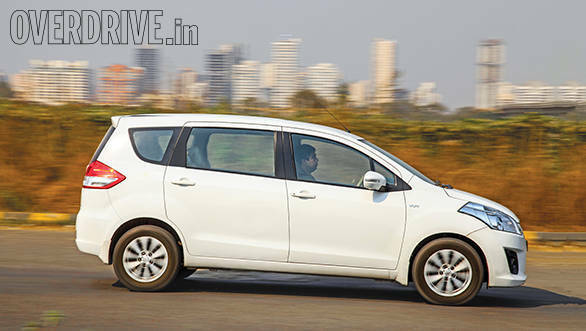 In town, the MPV returns 14.4kmpl and the number improves to an impressive 22.8kmpl on the highway. 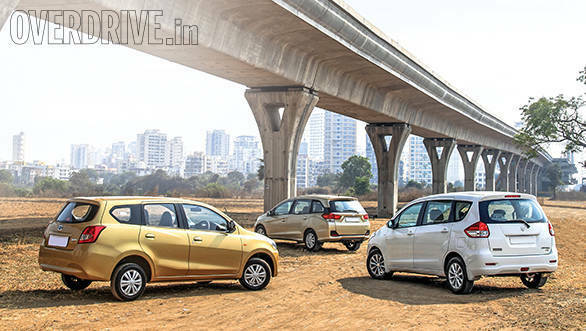 The Mobilio returns 11.1kmpl in town and 19.2kmpl on the highway while the Ertiga offers the least efficiency - 10.9kmpl and 18.4kmpl, respectively. 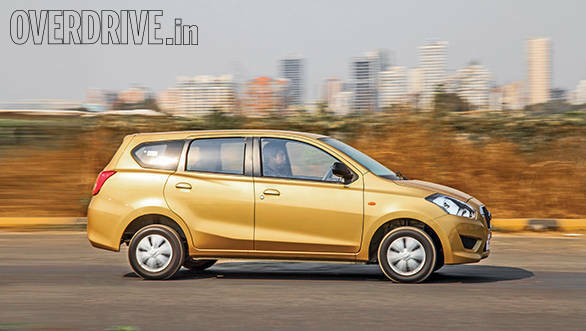 Datsun hasn't increased the wheelbase in the Go+, it is identical to the Go and this makes it as agile as the hatchback. Whether it is driving through congested traffic or parking in tight gaps, the Go+ does it with ease. The smaller footprint, low kerb weight and light steering clearly aiding the MPV in town. The 155-section tyres are, however, skinny for such a car, grip isn't impressive either and this is most noticeable while braking hard. A wider tyre with better grip should improve dynamics by a margin. On the highway, the car is planted but as speeds increase, the car tends to feel less stable and takes more effort to keep straight. 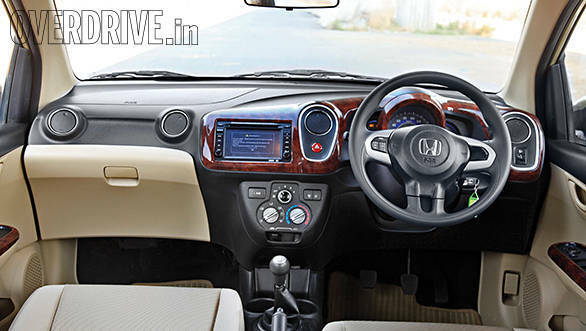 The Mobilio chassis offers a good balance between ride and handling, the steering feel is more direct - in fact, it is better weighted than the other cars from the Honda stable. Wider tyres and a not so soft suspension setup helps it hold the line well while body roll is controlled despite the higher centre of gravity. The Ertiga's Swift DNA clearly shines when it comes to dynamics. The MPV drives more like a car but surprisingly, the Honda is still the better handler. The Maruti's ride quality is however slightly better and the suspension soaks up bumps with far more ease and the occupants will find it more comfortable. Better rubber on both the Honda and Suzuki help improve braking performance. The Go+ price range starts from Rs 3.96 lakh and ends at Rs 4.81 lakh, making it a lot more affordable compared to the Ertiga and Mobilio. It also means that the Datsun competes with various other cars as well. At one end of the spectrum, the base Go+ goes up against entry level hatchbacks. At this price it is definitely worth considering as it offers a lot more cabin and seating space. It is also equally equipped and is as or more powerful than the other similarly priced cars. But then the top-end variant is priced close to entry level B+ segment hatchbacks and sub-4m sedans. Even in that segment, apart from the third row seat that can't accommodate adults, there is nothing that works in favour of the Datsun. Cars such as the i20, Polo, Xcent and Zest are priced only slightly higher than the Go+ and are much more superior products. These cars are more powerful, better equipped, offer higher quality and boast vital safety features. After all the Go+ is based on the Go hatchback that very recently was criticised for its poor crash safety test performance. Even the most premium Go+ variant does not offer standard airbags(a driver airbag will be offered as an option later) or ABS. But what about the Ertiga and Mobilio? Before we come to a conclusion, this can't be a straight comparison. 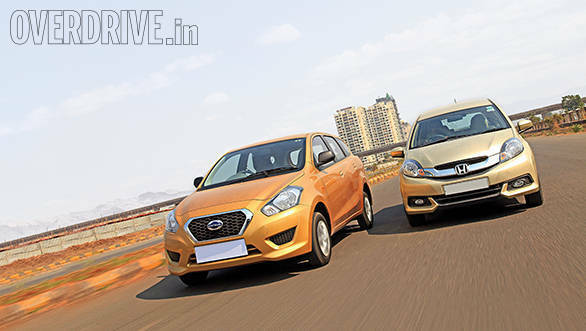 Though the Go+ is a compact wagon according to Datsun, the vehicle is primarily targeted at users who are looking at a family hauler. Which is why we ended up pitting it against these MPVs. While the most premium variants of the Maruti and Honda are significantly more expensive, the base variants are a lot more affordable. They can still seat seven adults and have space left for luggage, are more comfortable, more powerful, better built and hence, worth the extra money.